I've been purturbed by events at The Other Pool. My season ticket there is linked to three other ponds, separated by some distance; but the rules have changed for all four pools, and I am not too happy about that. When I bought my season ticket, last autumn, there were no rules at all. Then a "no luncheon meat" rule was introduced, because the fat content of meat was said to affect the health of the fish. As I rarely use meat, I could live with that, whether or not I agreed with the ruling. Now all floating baits have been banned, for no good reason. Why? the pool is very deep - up to 22ft, and although the farmer has taken 3.5ft off, or more, in recent hot weeks, for his fruit crop, the fish are stll thriving, busy and active. There is no problem with the oxygen levels. I arrived last Friday to read the new rules, and I had to make a snap decision on the bank. I only had bread with me, because I was unaware of the change. I used floating flake, and I caught three nice commons. Yes, I broke the new rules, and part of me felt like a cheat. But these are "Cider House Rules" - ie, rules imposed from on high with no consultation, in the middle of the fishing season. I bought my ticket, in good faith, when no such rules existed, and so I did not feel bound by them, I was the only person fishing, by the way. Even more ominously, the new rules ban the use of keepnets "except in matches", - and so it is clear where all this is going. Now I never use a keepnet, so that's good - it's the "except in matches" bit that bothers me. Responsible carp anglers, in short, are being asked to dance to match angling's tune, once again. I will not renew my season ticket, when in expires in the autumn. I must look elsewhere, and that is sad. I do not want to see any match angling on that pool, and in fact it is so snaggy and the fish are often so spooky, because they have grown up in a natural way, and do not require an angler's baits, I expect that any match there would lead to many biteless hours and/or fluttering lines in the breeze. Good luck to the pole guys. Hm. 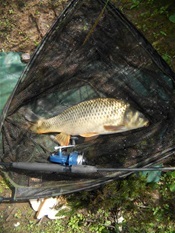 Changing contractual conditions might entitle you to a refund you know..."no floating baits"="no jaa" I can tell you.